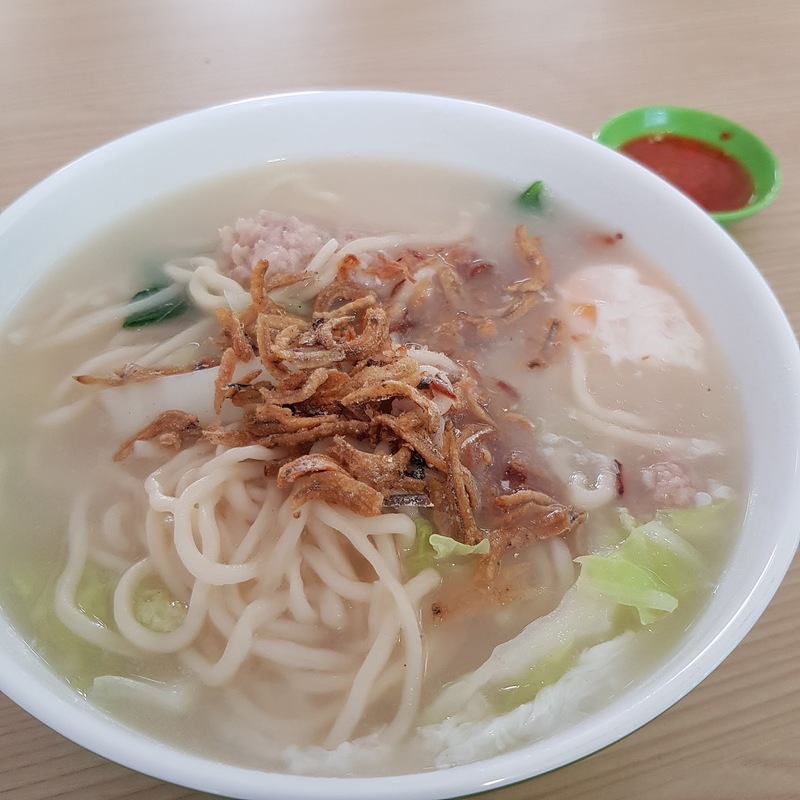 If you have followed FoodieFC posts on Facebook or Instagram, you would have noticed that I eat Handmade Noodles (followed by Bak Chor Mee) frequently. Whenever you go, whether it is hawker centre or a food court, you will always find at least one stall selling Handmade noodles. In most case, it is cheap, tasty and healthy (unless the soup is laden with MSG and you finish it) dish. 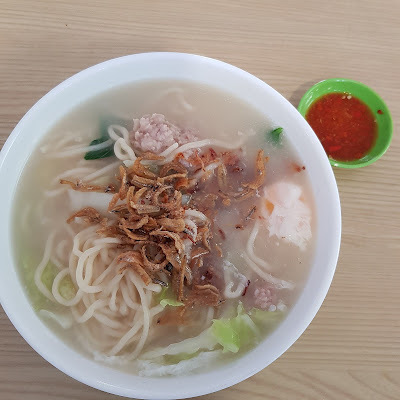 I am glad I found another handmade noodles stall in Bukit Merah area that suits my taste. 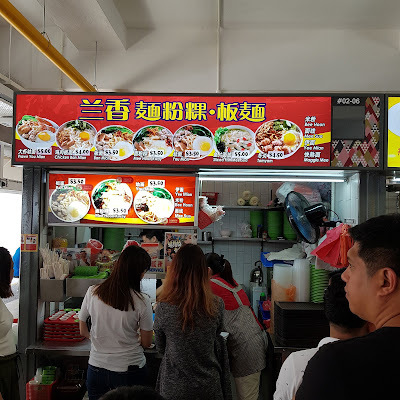 It is Lan Xiang Handmade Noodles 兰香面粉粿•板面 which is located at Bukit Merah Central Food Centre. The lunch time queue at this stall would be the best proof to this. There would always be a queue of at least 5 to 10 persons long. You would not need to worry about long waiting time as the two person team is well-oiled. The lady would go down the line, taking orders, taking out the noodles and collecting the payment. The man would cook the noodles juggling several stove at one time. You should be able to savour the noodles within 10 minutes after ordering. 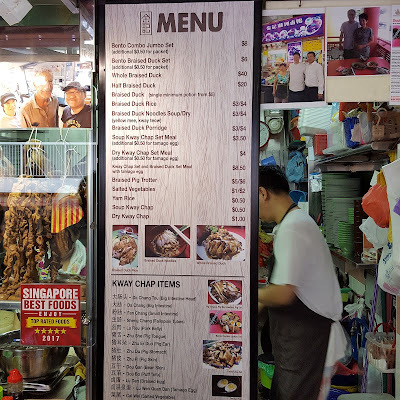 What makes this stall stands out among the rest is their noodles. It is not a secret and obvious that some handmade noodles stalls order their noodles from factories. Lan Xiang Handmade Noodles makes the handmade noodles themselves.Their noodles are of a thicker size compared to those that I have ate elsewhere. 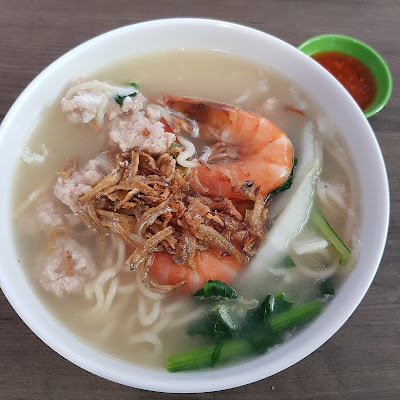 I have tried both You Mian $3.50 and Prawn You Mian $5. The you mian was springy, soft and flavourful. As for the soup, it was clear, robust, sweet and more importantly, it was not salty! Moreover, the minced meat was well flavoured and marinated! A very satisfying bowl of handmade noodles. 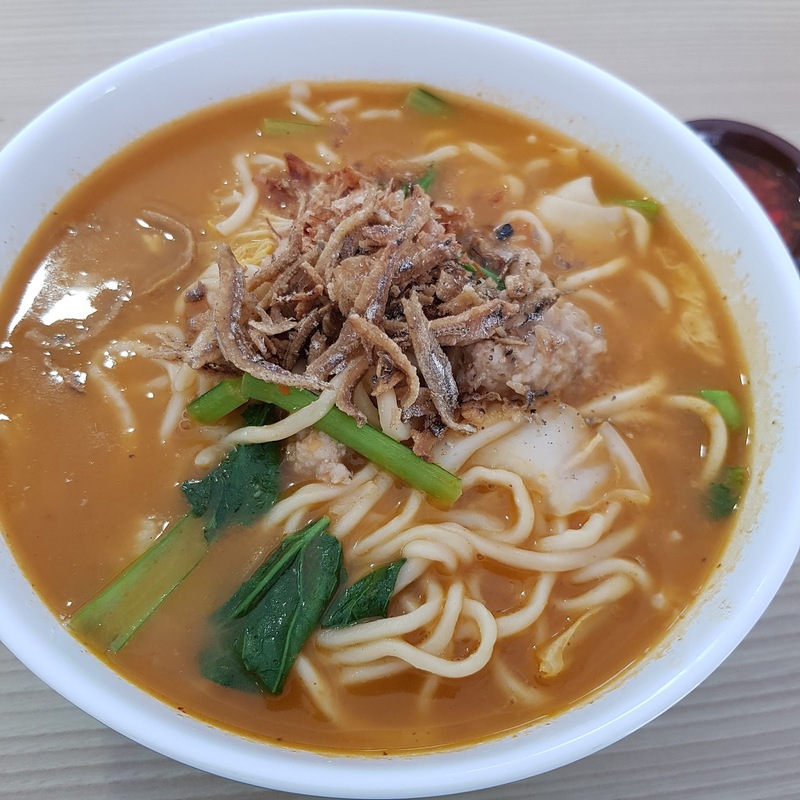 Although they also sell Tom Yam handmade noodles, most people order the normal version of handmade noodles. 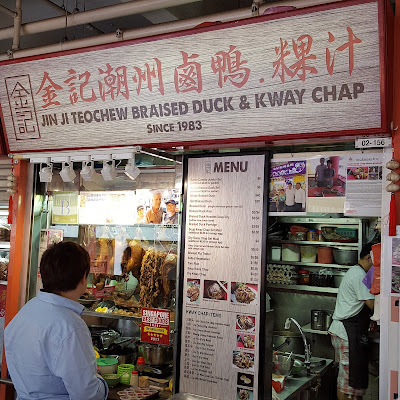 Jin Ji Teochew Braised Duck & Kway Chap 金记潮州卤鸭 has been a stall which I had always wanted to try. I first got to know about this stall when Melvin, the owner, dropped me an email invitation to try his food. I declined the invitation since I preferred to make an anonymous visit. 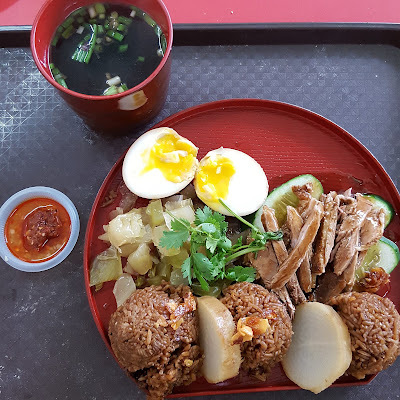 Since I happened to be at Chinatown Complex, I decided to pop by anonymously to try the food. Being a foodie, I had already knew what I wanted to try. I wanted to try what was unique at this stall, the Bento Braised Duck Set, a creative way to modernise and serve duck rice in a different way. 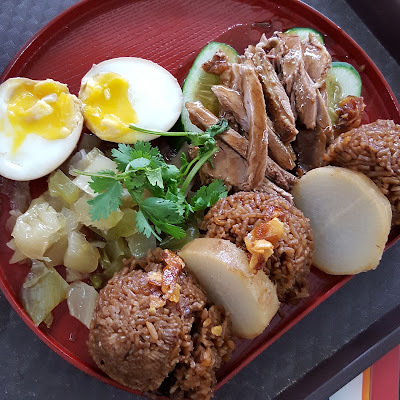 The Bento Braised Duck Set $6 consisted of 3 yam rice balls, radish slices, cucumber slices, salted vegetables, ajitsuke tamago (Japanese runny egg) and braised duck meat. It also came with a bowl of miso soup soup. I would give full marks for the concept, creativity and presentation! What an idea! Photos of this dish on social media would be eye catching. So instagramable! The braised duck meat was moist and tender unlike those that you may get elsewhere, where they are sometimes tough and hard to chew. The egg was perfectly executed. I had not expected the yolk to be runny! Wow! As for the soup, it had a very forgiving herbal taste and was amazingly addictive. What I thought could be improved was the radish slices. I would prefer my radish slices to be softer. I did not have to opportunity to try their Combo Jumbo set $8 yet. I wonder how their kway chap ingredients taste like.